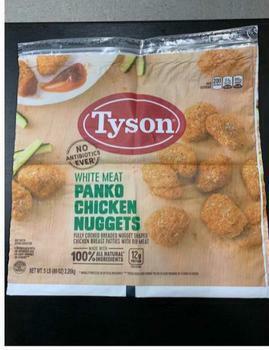 Tyson Foods of Sedalia, Mo., is recalling approximately 36,420 pounds of chicken nuggets. The products may be contaminated with extraneous materials -- specifically pieces of rubber. The recalled product, bearing establishment number “P-13556” inside the USDA mark of inspection, was shipped to retail locations nationwide. Customers who purchased the recalled product should not to consume it, but discard it or return it to the place of purchase. Consumers with questions about the recall may contact Tyson consumer relations at (888) 747-7611.